There are a few things that are better when they are bigger. These tend to be Swimming Pools, Hotel Bedrooms and Food (and I hear you at the back!). Something that I have always wanted is a cookie as big as my head and so when this week Big Boy and I decided that a Giant Cookie would be the perfect pudding to go with our Thursday Night Film night we knew we had to make one. Making the Giant cookie is surprisingly simple so just in case you want to make one too, this is how it's done. Cream the butter and the sugar together before folding in the vanilla and egg. Once everything is well mixed add in the flour and baking powder. Things will seem not to come together and just as you are about to add more flour will suddenly start turning into what looks like a normal batter. Toss in the M&M's (or chocolate chips or other hard shelled candy) and Marshmallows or any other ingredients you are using (for example reduce the flour to 100g and add 50g of oats and 100g of raisins and 25g of nuts) and mix until everything seems nicely spread. Get either a Giant Cookie tray or baking tray or pizza tray and lightly grease the surface (I mean lightly, in fact if you know you over grease skip this step completely or your cookie will taste horrid and fall apart). If you are using a pizza tray and it has holes in like mine trim a piece of grease proof paper to fit and grease that. Dollop the mixture into the middle of the tray and using a spoon slowly spread it out so that it is even across the tray. Put in the oven on the middle shelf for approximately 15 minutes on Gas mark 4, it might need a bit longer so if you want a crispy cookie keep cooking after the first 15 minutes is up and check every five minutes or so before taking it out to serve. If you don't mind it being soft (I like soft cookies) take it out after 15 minutes and allow to cool before serving. Last week we were supposed to watch The Smurfs as our Thursday Pyjama Night film, but we ended up watching Zookeeper. This Thursday we watched Journey 2 The Mysterious Island, which was kindly sent to us by Warner Brothers. They were very lovely and instead of sending us the ordinary Blu-ray disc they sent us the 3D disc so we could watch it in 3D! Honestly, I don't think I can explain how fab they are for having done that or how pleased Daddy was as he loves having a reason to break out the 3D Glasses! There were a few other bits sent with the DVD, some bugs, a Lizzard to hatch, some stickers, a jigsaw and a pen all served on a leaf tray! How fab is that?! So the film is the sequel to Journey to The Centre of the Earth which is one of Top Ender's favourite films. It is about Sean Anderson who receives a distress signal from his Grandfather from co-ordinates that are in the middle of the ocean. With his stepfather he sets off, manages to hire a Helicopter pilot (and his daughter) to take him and there they discover that there is an island there after all! Things are different on the island than they are in the rest of the world For example Elephants are tiny and tiny bugs like bees are huge and so to tie in with this, pudding this evening was a giant cookie! It is the size of my head, which I think we can all agree cookies aren't normally that size! Tonight's Family Pyjama night has been a great success and we can't wait until next week now. 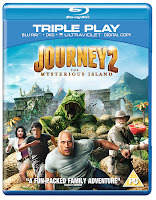 We were sent the DVD and goodies from Warner Bros, the Blu-ray 3D has an RRP of £29.99, Blu-ray Triple Play an RRP of £24.99 and the DVD (single disc)has an RRP of £19.99. Last year was Top Ender's first concert and I was the parent that went (Daddy and BB stayed at home to have some fun) this year, Daddy went to The Summer Music Concert at Top Ender's School whilst I stayed at home with Big Boy to have fun. Top Ender and the rest of her fellow Violin students were brilliant and here is the video for those who like me couldn't attend. Just like last year, we gave Top Ender a treat when she got home for a brilliant performance, last year it was flowers and this year it was a McFlurry! I'll be adding the video to the A Mothers Ramblings TV stream soon! If you want to see how I made it take a look at Probably The Best Summer Salad Recipe Ever it's really simple to make and oh so tasty! Big Boy and I had so many things that we wanted to do before he started School this coming September, we even made a Things To Do Before Starting School list. We have been playing a lot and generally having fun and we have made huge progress in a few areas that I thought might help him when he starts School but the one thing that we haven't really done is go swimming and when last week a huge envelope came home with details of Big Boys start date at School I knew that we really had to get going! Big Boy is going swimming with Daddy every other week as part of the Daddy Date Nights, but I know that if Big Boy is going to learn to swim he needs to be going more regularly and it wouldn't hurt if I took him once a week too. So when on Monday morning I was up at 3am with a sore back, I thought I should test out my new swimsuit from Simply Swim (who had suggested I might like to take a look at their Ladies Speedo Swimming Costumes and pick one, but I ended up going with a Zoggs one) and take BB for a swim too. 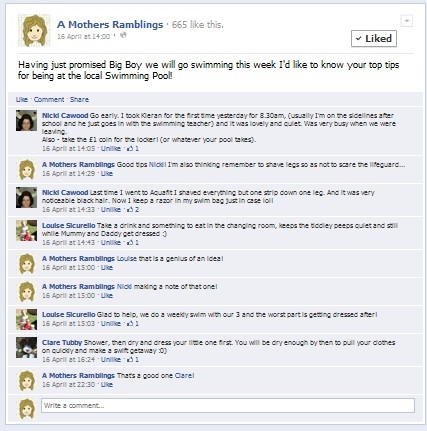 I had been planning to go swimming with BB already, as a few weeks back I asked all those who have liked the A Mothers Ramblings Facebook page for their top tips about going swimming with children and I got some great suggestions! Nicki suggested that I go early so as to make sure everything was nice and quiet, but that kind of backfired for us. General Swim opens at 9:30am on a Monday and as the local schools also have swimming lessons from 9:30am on a Monday it was a little crowded. Louise suggested taking a snack that BB could eat whilst I'm getting changed after we got out of the pool, that way I would be able to get changed without having to worry about Big Boy running off and me flashing everyone again. The problem was that I was so busy trying to take a photo of me in my swimsuit I forgot to actually get changed before BB finished his juice and snack! Even worse the photos that I took of me were all blurry, so I can't even use them! I chose a Shorts Leg Swimsuit because of the extra covering available. I didn't think about it from a modesty point of view but more a "I really don't want that much flesh on display when I'm not happy with my own body" point of view. The costume arrived so quickly after ordering (the next day) and so I have been practising getting in and out of the costume as it is going to be some time before I'm doing it as elegantly as I might like as there isn't any Lycra in the costume, but it's comfy on and it was good in the bust area with hidden support. We really enjoyed our swimming session and just in case we feel like going again this week I've already washed our costumes and Towels and they are just hanging out to dry in the Summer Sunshine. I was sent a swimming costume that I chose from the Simply Swim website. Big Boy loves water play and he loves playing with his Lego Duplo so whilst we have been having this lovely warm weather we have been combining the two and learning a bit about how things float and how to make different size splashes too. We filled up a big bowl with water (which we used afterwards to water the plants) and then used the Lego from the Duplo sorter to create boats, towers, animals and Big Boy even made a rocket at one point. Big Boy loved creating the different structures and he loved playing with his bricks in the garden too. I had to explain at one point that all he needed to do to dry the bricks off was to leave them in the sun instead of rubbing them in his Tshirt, but the bricks were more fun being dried in his shirt it seems. I then suggested to Big Boy that we could learn something from these bricks, all we had to do was play and we could see what we could find out. Big Boy loved pouring the water from inside the bricks and into the bowl and he was having great fun splashing about and cooling himself down. He didn't understand at first how to manipulate the bricks to create a large splash, but with a little experimenting he was soon able to demonstrate what he had discovered. We had great fun playing together, experimenting with the water and generally keeping cool. Big Boy is so clever and I hope he always has as much fun learning as he did today. Every Saturday I post about our main meals for the week, but what I haven't been blogging about are the packed lunches that I make for Top Ender, Big Boy and I. When I was posting the pictures of the lunches I was making for Tops and her special Friday Lunches there were some who wanted me to make them a lunch box up too, so I thought that this might help everyone get a few new ideas and also help me keep track of what Tops, Big Boy and I are eating for lunch. I don't make lunch for Daddy (unless I'm making a rice dish) as he keeps bread and sandwich fillings at work and I will only say what the main part of the meal will be, and not include the fruit or the drink or the sweet treat, but I will try to remember to tweet or post a photo on Facebook so you can see what else is included! Monday tends to be a Chicken based meal as I keep some of the Chicken from the Roast the day before. Tops really loves Chicken Skin, so it won't be as healthy as it sounds for her, but I figure she is a growing girl and she deserves a treat come Monday lunchtime. Tops doesn't like Salad Cream or Mayonnaise, but I do add a very little amount to her wrap, just to stop the filling becoming dry. For BB and I we tend to have a bit more Salad Cream or Mayonnaise with the chicken breast all mixed up together as we like the taste! I find that buying wraps once a month and freezing them (with a bit of greaseproof paper in between the wraps) means that there isn't any waste with wraps going off, and also makes it easier to get the right amount out to defrost as they aren't all stuck together. I think that it's really important to have at least five portions of Fruit and Veg a day (we average six a day not including juice) and whilst both Tops and BB love eating fruit and will eat veg I still find it better to sneak in extra portions. Grated Carrot mixed up with Grated Cheese is a favourite because the taste and texture compliment each other and when they are stuffed in to pitas they are more colourful than just plain Cheese. I cut the Pita breads in half after toasting to make two pockets and have to remember to not over stuff them as Top Ender always moans that I put in too much. I can't help it, I like to know she has a good lunch ahead of her! I don't think you can do better than a midweek ham and cucumber sandwich . My family always had mustard with their ham, but I really can't eat it like that as mustard is too "hot" for me. My Aunt taught me to put a little mustard and a little mayonnaise on to one slice of bread and to mix them together to create a less mustard tasting sandwich and when Tops and BB are ready for trying this diluted mustard accompaniment to their ham sandwich I'll be ready! Tops and BB are both white bread fans and I'm a Wholemeal bread fan so we normally go with the loaves that mix the two, but this week are are trying the new Hovis Premium British Farmers Loaf so we will either have a White loaf or a Wholemeal loaf. Maybe we should have one slice of each?! Tops loves Sausage rolls, it doesn't matter if they are home made or shop brought and so it's Sausage Rolls with Dip for lunch today. It depends on what we are feeling in the morning to if they will be hot at lunch or not. I have two brilliant thermal Bento lunch boxes so if Tops wants them hot she can do, and if she wants them cool then we can arrange that too! Every Friday I make a special lunch for Tops and this week is no different. I'm going to make a Quiche but the exact details of the Quiche are a secret... you'll just have to pop back to see what I make later this week! Last weeks meal plans had to be slightly changed, we didn't have the Roast on Sunday because we ended up spending the entire day out in London and we had Fish and Chips on Monday night instead of the stir fry as we thought the children had been so good they deserved a treat, but the good thing was that we still used everything that we had brought. This week I am trying to restock my freezer so will be making a lot of meals which can easily be doubled up and stored in the freezer for another week. I also need to get some more cookies and cakes in the freezer as my supplies are running low! Daddy loves a good curry, but the children so far have refused to take after him and prefer things which do not have any spice to them. I decided it's about time that they took the plunge so will make a Sausage Korma for us all to share. It will be very mild, but I'm hoping that because it is sausages they won't notice! Yes, it's Sunday and we will be having a Roast Chicken. Last week we didn't have a Roast as we ended up going out on Sunday to the Science Museum so we are all really looking forward to a nice Roast. If we are all really lucky then we might even eat it out in the garden too. I just have to persuade Daddy to help me move the garden table! I will make double the amount of Jacket potatoes and freeze half for a meal another week. I'm thinking Cheese and Ham Double Baked Jacket Potatoes would be lovely next week! This week we will have Jacket Potatoes with Beans and Salad (Look out for my Apetina Salad recipe here and on the Apetina Facebook Page!) and a bit of grated cheese over the top. Do you remember the Turkey Pin Wheels with Peppadew Peppers recipe I made up the other week? Well I'm making a few variations to it this week and trying again making it for everyone. There was only just enough for Daddy and I when I last made it, so I'm thinking that I will serve it with Rice and do a side dish of Salad (left over from yesterday) and if everyone is still hungry then we can have a pudding. I'll probably make some cake for us to share. Last week I did end up making double the amount of Lasagne, I normally make them way to big and so I think that if I stick with my normal recipe and make two smaller ones I might actually lose some weight. With this in mind I've decided to make Pasta Bolognese this week and I'll make double so I have one portion for the freezer for a meal in the near future. We're having Pasta instead of Spaghetti so we can use up the last box of Pasta that Daddy has. I could end up having a week of freezer meals at this rate! 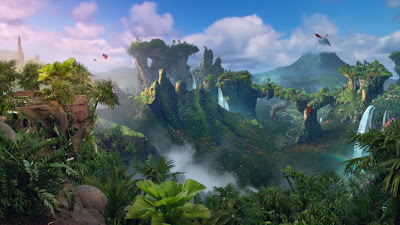 We are serving it with pineapple and mashed potatoes and a selection of vegetables to go with our film of Journey 2 - The Mysterious Island that Warner Brothers are sending to us to watch. We have seen the film at the cinema and we loved how little things were big and big things were small so we are going to do that with our dinner! Yesterday we had a great afternoon/evening. When Daddy came home it was still sunny and so we all either sat out or played in the garden. It was such a lovely Summer evening that I thought I would be prepared for next Friday by having a meal that will be good in the sunshine or the rain. If it is sunny then I'll prepare these on the BBQ and if not then I will grill them in the kitchen. It's a perfect solution. The Chicken will be cubed before being put on to skewers. I'll then roll the chicken skewers in a honey mixture (Honey, herbs, lemon juice and some Olive Oil) before sprinkling sesame seeds over the top. I'm not sure what to serve it with other than Rice or Rice Noodles, so if anyone has any suggestions please let me know! I am so excited for tomorrow! 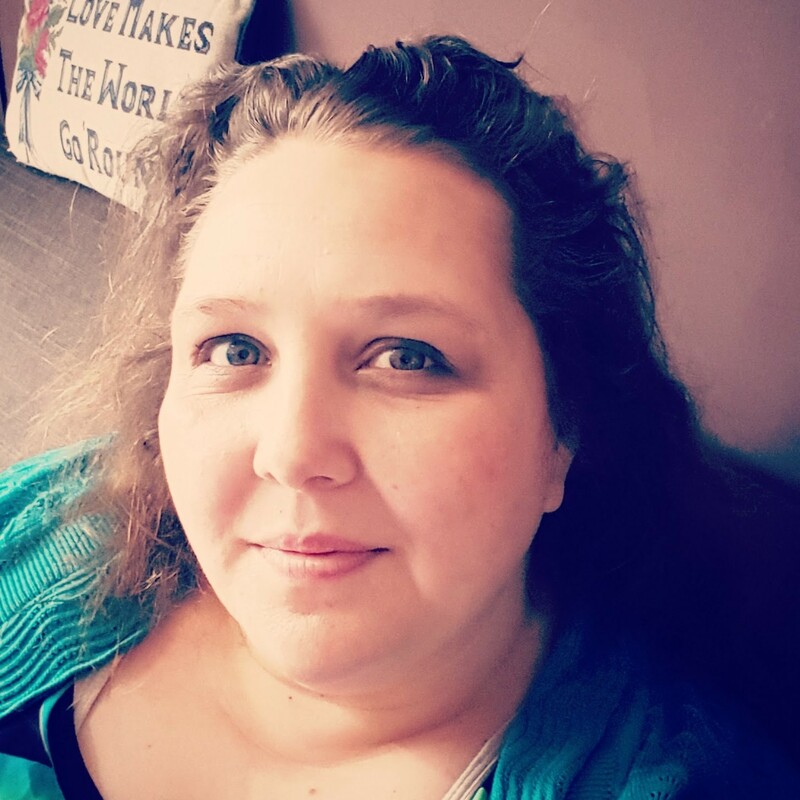 I have a blog post that is to do with food and meal plans, and will be a regular weekly post too, but you have to wait until tomorrow to find out what it is all about! Make sure you come back tomorrow or have A Mothers Ramblings in your RSS Reader so you don't miss it! When I went to New York as part of a Student exchange back in the 90's the family of the home I stayed with had never been to Ellis Island. The father thought this was terribly lax of him as his family had immigrated and so it was part of his history, as well as being a local Tourist attraction. I remember thinking at the time how could someone who lives so close to one of the most famous landmarks in the world never have visited, but thinking on it if that is bad then what does that make me? I live in Milton Keynes one of the easiest places to get to anywhere else in the UK and yet I have hardly been anywhere! This led Daddy and I to be talking about the local attractions in Milton Keynes and we realised that there were hundreds of places that we hadn't been to in the local area. There are parks and farms and woods and art trails and churches and bits of history and lots more that we probably don't even know about. So I'm going to change that, I'm going to explore my home town and the rest of Great Britain as much as I can and I need your help to do so. It's easy enough for me to find out about the hidden attractions of Milton Keynes, I can ask my neighbours, read the local paper and even visit the local libraries for ideas but what about you? What are the local attractions to you that you have (or haven't) visited that you think I should check out? Where have you been in the past that you would recommend to other Families to visit now? If you are a blogger then why not be a Home Grown Tourist too and write a post about somewhere you have been and then link up with me below. Let me know if you have any suggestions of places that I should visit and I will do my best to get there! On a Thursday night, Top Ender, Big Boy and I have a Family Pyjama Movie Night. It had started off that we made sure that we ate together at the table and we ate food that we couldn't normally eat when Daddy was around (things full of wheat and Gluten) but we slowly started to turn it into a family night for just us three. Then when walking home from School one night we got so wet and cold, thanks to the lovely British weather, that we jumped in a bath as soon as we got home just to warm up. Of course there was no point in getting dressed again so we all got into our Pyjama's and it was just so comfy we decided we would have to do it again on the next Thursday. Now, when we get home from the School Run on a Thursday the Children go out into the garden for a quick run around and blast of fresh air (Yes, even if it's raining) and I normally start preparing for the evening and getting a few last minute chores done. Big Boy loves this play time with Top Ender and Tops uses the time to help teach BB skills he is going to need when he goes to School. It's amazing to see them writing on the path together and skipping out numbers on a hopscotch court and I love that Tops has taken it on herself to help BB to learn how to count and write. When they come in we all get into our Pyjamas and find our dressing gowns and set up camp on the sofa. We all get comfy and probably just look like a tangle of arms and legs. We watch a few TV programmes and talk about what went on in our day and we share some popcorn too. It depends on what the weather is like to what we drink, it might be Hot Chocolate, Milkshake, Water or Squash we aren't fussy! After a few cartoons we start cooking our evening meal together, it might be that the children set the table or help measure out the ingredients whilst I do the actual cooking or they might be more involved depending on what the meal (you can read my Menu plan to know) is but with everyone working together it means that we get our meal on the table in the quickest time possible. After we have eaten we forget about doing the dishes and instead sit down together to watch a film. I've started making dinner so it's themed with the film and so the children try to have a guess before the film starts as to what we will be watching. Tonight we are watching The Smurfs movie, we missed it when it was at the cinema (okay so we didn't go on purpose because the Cinema is just too much money) and we can't wait to see it. We have a Home made Cheesecake to go with it (Smurfs eat Cheesecake right?) and we can't wait to have a Family Pyjama Movie Night. What would you do on a Family Pyjama Night? This week I was supposed to make a Haddock Stir Fry for dinner on Monday night, but when it came down to it we decided that we should make Fish and Chips instead. 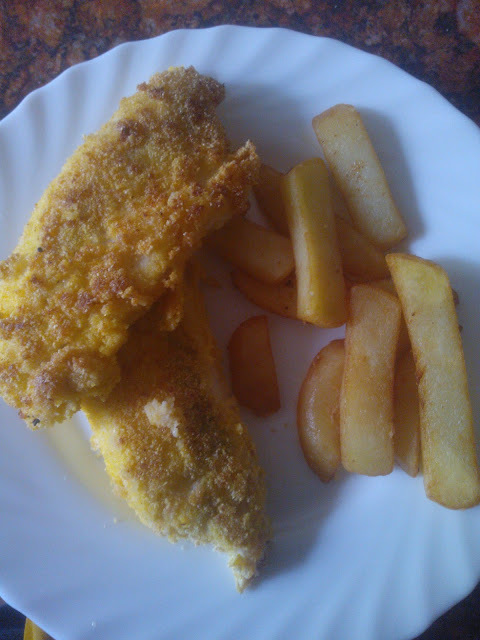 The last time I tried to batter fish was when I made some Fish Fingers but I had high hopes! I normally have Haddock when we have Fish and Chips for a Take away as being brought up by a Scottish Mum it was what she always had (also in my experience, it's more popular in Scotland than Cod) and so it's what I would always order too! Daddy on the other hand prefers to order Cod and the children prefer less fish and more potato when they have fish and chips, so this was going to be a big test! We had been sent four Haddock Fillets from Regal Fish Supplies via Fish Is The Dish and I had frozen them until I knew what I should make with them. I defrosted them in the fridge and because Daddy and the children don't like the skin on their fish I removed the skin (which was surprisingly easy) and cut the Haddock fillets in half. The fillets were really lovely fillets, and the scales had been removed, which pleased me as I hate removing the scales! I liked having the fresh fish delivered to my door as I don't know of a fish mongers in Milton Keynes and so getting fresh fish unless it's from the supermarket is a rarity. I used a fork to mix up two eggs before dipping the fillets into the egg mix. I let a lot of the mix drip off before rolling in a dish I had sprinkled some Polenta in to coat the Haddock fillets. I dry fried the Polenta covered Haddock fillets in a hot frying pan for a few minutes on both sides before transferring to an oven tray to keep warm in the oven whilst I made the chips. The fish was really lovely, it fell apart as we ate it but more importantly EVERYONE ATE IT! Big Boy wolfed it down (as did Tops) before I had even finished eating mine and I eat quickly. This will definitely be something that I make again and I think that everyone will ask for too. We are having a McDonalds with my Sister and her family and my Mum at lunchtime so for supper we will make do with what is in the fridge. I am thinking that it will be something like sandwiches or if the Children want something warm beans on toast. If we are feeling very adventurous there are some leftovers in the freezer from the last couple of weeks that we can sample too. I know boring. Roast Chicken (again) and Roast Potatoes (again) and Veggies. The thing is my family love a Roast and Chicken is the cheapest at the moment. Plus it's so simple to make that I could make it whilst I'm asleep. Luckily I don't make it when I'm asleep I make it when I'm listening to the radio and I love a bit of EP on Sunday and Johnnie Walker too. It's funny since I went to the Good Food Show (and won the Masterchef Invention test!) and being part of the Fish Is The Dish campaign I've been more adventurous with what I am cooking and in my attempts to cook too. I would never have cooked a fish stir fry before, but I thought that a Haddock Stir Fry with some Prawns with be a good start to the week. Daddy loves to grill Pork Steaks before topping with Apple Sauce and Cheese and then we serve it with Mash and some Veg. As I'm trying to keep my calorie count down I won't have the Cheese on my pork and I'll just have a small amount of Apple Sauce too. We haven't had Lasagne for a bit and it's something that everyone loves and I already have all the ingredients for too. BB and I will make it in the afternoon and then put it in to cook so that it is ready in time for when Daddy gets home from work. This is a great meal to double up on, but I don't have enough mince in the freezer so I won't be making one for us and one for a later date this week. Thursday night is movie and PJ's night. We get into our PJ's almost as soon as we get home from the afternoon School Run and we slob about. The Children are allowed a piece of Chocolate as an afternoon snack and then we eat dinner at the table together before watching a film together. I thought that this week we would watch The Smurfs in 3D and as Daddy is home this week, dinner will be a simple Pizza so we can all look forward to Blueberry Cheesecake for pudding! Friday night food should be special and comforting and the perfect set up to a family weekend. So this week we are having Hot Dogs in Wraps. It's the first time that I've made gluten free flour wraps so just in case they are terrible I will have some from the shop on standby! I used to make Breakfast wraps and I miss those so I will add Mushrooms and an egg to mine but I think that everyone else will just go with onions and ketchup. I said on Saturday that I was making Turkey Pin Wheels with Red Peppers for dinner last night, in my What We Are Eating This Week Post and I was asked by several people for the recipe on Facebook and Twitter. As I am terrible with giving recipes in a timely manner I thought I would put this one up as quickly as I could. We were sent some Peppadew Peppers as I had been asked to take part in a British Turkey Recipe Competition and as usual I've not done anything about it (like gone to buy Turkey so I could be reimbursed as they suggested) but the peppers were sitting in the cupboard taunting me every time I looked in there and I knew I had to do something. I had a packet of Turkey Quick Cook Breast Steaks in the freezer which I defrosted and then bashed thinner using my rolling pin (and some baking paper as I had run out of cling film). I then added some sliced greens and a couple of the peppers sliced in half and rolled the Turkey around the filling. I used some toothpicks to keep the turkey together and then put them in the oven on Gas Mark 4 for thirty minutes. They smelt really lovely and despite having said I would make it with Rice I really wasn't in the mood for rice and so with agreement from Daddy I made some Hash Browns to go with it. Daddy really loved the Turkey Pin Wheels and asked me to make it again but I think that the next time I make this I would chop the peppers more finely and mix it in with some Cream Cheese and Spinach instead of Spring Greens. The peppers were hotter than I expected, and I think that the Cream Cheese would just make it more suitable to my palate. I'll let you know how it tastes like this in a couple of weeks! I received a jar of Peppadew Peppers and was offered to be reimbursed for a selection of Turkey cuts, but as I buy Turkey regularly I didn't see the point! Big Boy received delivery of his latest Dora The Explorer Little Cooks Magazines this week and with it was a table mat which Big Boy decided to have with his lunch this Sunday. The only problem was he wanted everyone to have a new mat and so Daddy hit upon the idea of making our own table mats and then using my new Laminator to protect the mats against spills. 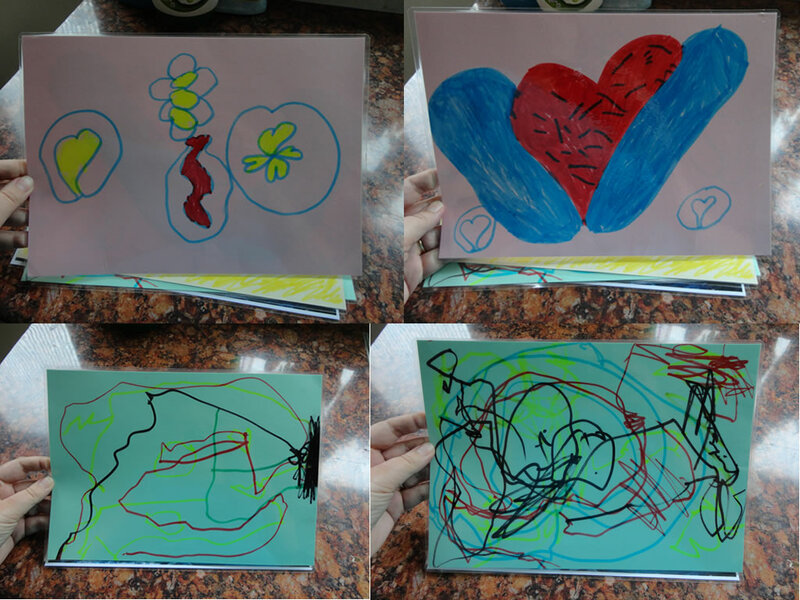 Top Ender created a double sided mat based on hearts and Big Boy drew a boss man (that's what he loves to draw these days as he is convinced we can put them into a computer game) as he didn't want to be left out! and I drew a seasonal double sided mat to satisfy my need for Sun and Snow! We might not be the world's greatest artists, but making the mats was great fun and as usual we all loved being creative and working together. Tops has decided that we should make mats for all our guests when they come for dinner and that we should make ones for special events too (I'm thinking Queen's Jubilee and The Olympics to start with). Dinner tasted great on the mats too, just in case you were wondering, but what would you make your mat look like? Or How Much BB loves Mario Party 9! For the last few weeks there has been a big Mario revival in our house, with our Sunday nights gaming mainly revolving around playing Super Mario Party 9. 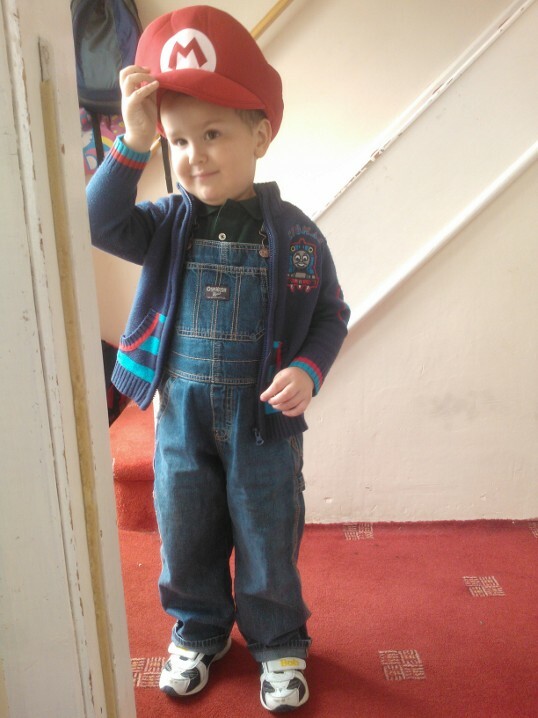 Daddy had brought the game for us a few days after it was first released as he knew that it was going to be a big hit, especially with Big Boy who has a huge obsession with all things Mario! When Top Ender was small, Daddy would take her swimming each week and leave me at home to do whatever I wanted. It was the original Daddy Daughter Date night and had four main benefits, Daddy and Tops got to spend time together, Daddy got a bit of exercise, I got to relax and Top Ender got confident being in the water. When our circumstances changed with Daddy working almost every waking hour, I took over the weekly swimming sessions before circumstances changed again and we found we had to stop. Even date nights have been on a temporary hiatus. Daddy and I were talking during the week and we realised that we needed this quality time again with each of the children and so we came up with a plan to have a two week rotation date night with Tops and BB, where each week Daddy would take one of the children on a Swimming Date and the other would stay at home with me having a Date night at home. The children are really excited about the swimming and have agreed that going every other week is a great plan and I have promised them that the at home dates will be just as fun as swimming. The pressure is really on for me to come up with some great ideas to have some fun with Big Boy and Top Ender each week. I remember that Daddy and Top Ender would round their Swimming Sessions off with a chocolate bar from the vending machine, so I'm going to need to make treats each week too. I'd like to do the same date night with each of them before swapping to something new for the next two weeks and I have a few ideas, but I'm open to suggestions if anyone has any! I had a great meal plan this week with some meals linking in to some bits that Tops was taking part in at School. Then, as seems to always be the way, School had a change of plans (after being offered a great opportunity) and so I thought I would swap the plan around to make more sense to us as a family. Now the meal that we were all going to be looking forward to on Friday is Saturdays meal. We're having a little bit of a problem with BB at the moment as when we are eating our dinner he is not eating the meat, or the vegetables and just sticking with the potatoes or the rice. I'm trying to make things a little more tempting for him and this week we are veg heavy, but I'm going to serve them in ways that I hope will tempt BB. We are also growing a lot of veg at the moment thanks to Birds Eye and my birthday gift of two mini Greenhouses and hopefully this will also help BB to eat more variety again. For dinner I'm making Grilled Breaded Prawns and I was just going to do home made chips but I decided instead to do some oven baked chips of Potato, Carrots, Sweet Potato and Beetroot. I thought that that the beetroot might change the colouring of the other chips and with hidden beetroot and carrots amongst the chips we might get more nutrients into BB than normal! Knowing Daddy he'll have some Sweet Chilli Dip with the Grilled Breaded Prawns, but I'll make some pink dip for Tops, BB and I either by mixing some Mayo with Tomato Ketchup or Tomato purée. Sunday - Rosemary and Garlic infused Roast Chicken with Potatoes, Cauliflower Cheese, Carrots and Peas. For us Sunday is Roast Day. As Daddy normally gets up with the Children they all eat something early for breakfast and then they eat again when I wake up. With us all having something fairly late on a Sunday it means that we push back the Sunday Roast to around 3pm and we don't eat an evening meal. For this Sunday I'm thinking that we will have our Traditional Roast Chicken. We tend to go with Roast Chicken because out of all the joints that we like (eg Pork, Lamb, Beef, Chicken) it's Chicken that works out the cheapest and on a budget that's important. I'll roast it with Rosemary and Garlic as it was nice when I did that a couple of weekends ago and I want to use my Rosemary plant for the purpose we brought it! We are back on the Jacket Potatoes! I gave the family a couple of weeks off from Jacket Potatoes and got complained at for them not being on the menu by BB, so they are back on the menu this week! I thought Bacon would be a good choice to go with them as I was already using Bacon later in the week and so thought I might as well use it all. Big Boy and Tops (and Daddy) will have beans and cheese with theirs, but I'll go with some green stuff (again it's being used later in the week) or possibly some beetroot if there is any leftover! Big Boy is turning Four today! 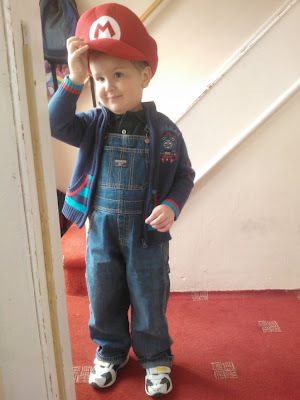 Daddy is taking the day off so that we can spend it with Big Boy, we have spoken together about what Big Boy would like to do and he has decided he would like to go Swimming and as it is his Birthday he gets to choose what we eat in the evening, those are the rules in this house! Big Boy is really into Mario and thanks to some really great Mario Party 9 bits we have some great decorations planned. Take a look on Tuesday morning for what we did decorations wise, and for some links to the downloads so you can make some of them too and of course so you can all smile at the birthday cake I'm making him! For dinner Big Boy has been deliberating between having McDonalds (apparently his most favourite food ever. Apart from Potatoes and Noodles and Jelly and Fish finger sandwiches and Ham and Scones and Pizza and Chip Butties and whatever else I have forgotten that is.) or a Mario Dinner. As a Mario Dinner is Meatballs and Spaghetti and we always have the ingredients for them available to us we can wait until the last minute for him to decide what we are having. A while back I was asked if I would like to take part in a recipe competition using British Turkey. I had said yes, but with one thing and another I haven't actually done anything... I should probably hunt the PR's email out shouldn't I?! Anyway they sent me some Red Peppers ready for when I do do something and I thought when I saw them in the cupboard I could do something this week. I have an idea in my head about Turkey and Red Peppers Pin wheels, I have no idea if it will work but I hope it will! I'm thinking that I could include garlic, some Kale (or the other leafy greens that I got this week) and roll it all up and bake until cooked. I'll do Daddy's trick and make a bed of rice. I know it's stupid but because I can't "see" any vegetables in the dish I'm debating if I should serve some Carrots and I'm thinking adding honey and sesame seeds will encourage the children to eat them. As you may have guessed reading my previous Menu plans Daddy will be at work on Thursday night and so we can have something full of Gluten and wheat tonight if we want to. I thought we all deserved a treat this week so we are going to watch a film and have a film themed dinner. I have been thinking about Tangled a lot over the last week or so and so I thought we could make some Creamy Spaghetti (as it's long like hair!) add in some bacon, onions, mushrooms and some wilted Kale (or some other Leafy Greens) and we have a pretty scrummy meal. Well I think so at least. I had spoken with Daddy about almost every meal that we were having and why we were eating them (he wasn't keen on the beetroot chips!) but neither of us had any idea about what we should eat this Friday and so I had to decide what our special Friday meal would be with just the help of Big Boy. Seeing as he only wanted chips he wasn't much help... but he did remind me that Top Ender had asked earlier this week if we could have Chips and Gravy for dinner. I thought that a Beef Poutine would be great, which as far as I know is a French Canadian dish of Chips with Cheese and Gravy. I'm adding some shredded beef as I hope that BB won't notice it too much and will eat some which we can then use to our advantage in pointing out to him that he has eaten Beef. I've never made it before and I'll use Mozzarella instead of Cheese Curds, but I think it will still count as a Poutine. It's okay though there will be Chinese instead. This afternoon Daddy and I were going to be heading off to London to the Royal Albert Hall for a Pre-Olympics Event "Our Greatest Team Rises" that sounded absolutely fantastic. 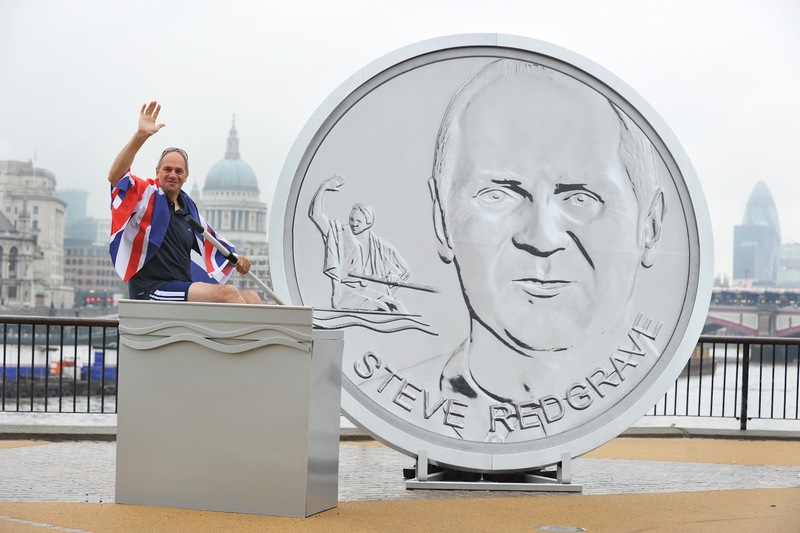 We are all really looking forward to the Olympics her at A Mothers Ramblings and we thought having a chance to meet Sir Steve Redgrave, catching up with friends and watching some great performances would be a great way to celebrate the Olympics nearly being here. As is to be expected at the moment with us (everything is going wrong at the minute!) there was a nearly last minute hitch and it meant that Daddy and I had to turn down our tickets. Anyway we are still really excited about The Olympics and I'm quite looking forward to collecting the Medallions that have been created (with BP, The British Olympic Association and The British Paralympic Association) representing the winning moments of 12 British Olympic and Paralympic legends. 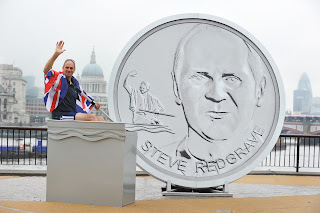 The medallions are available to buy from BP forecourts nationwide and I'm guessing that they are smaller than the one Steve Redgrave is pictured next to! So tonight instead of listening to Gary Barlow and Alfie Boe, I'll be having a Chinese, watching some TV and writing some bits for Pippa World. Way better than hobnobbing with Royalty eh? There is an ongoing debate in our house about Pizza and if it should be deep pan or thin crust, if it should have pineapple on it or not and if it should be eaten with cutlery or just picked up with your fingers. In fact the only thing that we can agree on about Pizza is that we all like to eat it! I was sent a voucher by Dr Oetker to try the Ristorante Pizzas, but before it even had a chance to arrive we had Pizza for dinner and it just happened to be a Dr Oetker Ristorante Pizza, which I had brought the week before. We were busy doing normal family things which meant that Daddy cooked the pizza and I think all he did was put it in the oven, before taking it out for me to take a picture of the pizza before he cut it. The children really loved the pizza (well Big Boy agreed with me that pineapple doesn't have a place on Pizza) and ate it up without any complaint or help from me. I know that the adverts claim that they have the best pizzeria taste this side of Naples, but this pizza did really remind me of the pizza Tops and I shared when we were in Verona. Not quite Naples, but it was still authentic Pizza in Italy! We have a couple of the ristorante pizzas in the freezer ready for late night snacks, after School treats and last minute meal plan changes. They might not be deep pan like I prefer, but they are tasty and Tops and BB will never say No to Pizza. We were sent a voucher to buy a Dr Oetker Ristorante Pizza, but I haven't used it yet because I forgot when I went shopping! Everyone seemed really shocked this year when I said I was making my own birthday cake. I'm not sure why as I'm pretty certain for the last ten years I have been responsible for making them for me, for Daddy, for the Children and anyone else who has wanted them too! This year I did have an ulterior motive for wanting to bake my own though as Stork had sent me the new Easy to Mix Baking Liquid to try and I thought that my birthday cake would be a great place to start. I'm terrible when it comes to baking cakes as I tend to cheat and instead of creaming together the butter and the sugar first I just add everything into one bowl and whisk until smooth. It works for me and I have to say that I think that my cakes taste pretty fantastic, even when they are made with gluten free flour! With the Stork Baking Liquid being ready to just mix in it is perfect for creating a smooth batter within seconds, which meant as I hadn't started making my cake until ten minutes before the school run I didn't waste any time. I was planning on making a large pink birthday cake, but as there was so much batter I thought it might be better to make a few cupcakes as well as the main birthday cake. Gluten Free flour, in my experience, needs a lot of liquid and I think that having the Stork liquid really helped as I didn't have to add extra to help keep the batter moist. All the cakes were beautiful tasting, Big Boy is always appreciative of my efforts and was trying to eat as many of them as possible at the restaurant, but we managed to save a couple to drop off at my Mother In Laws for her and her friend (Boyfriend?!) to have after their meal out too. It isn't just me who thinks that the Stork East to Mix Baking Liquid is good though. As is traditional on a Sunday evening, Daddy went to make Scones. Daddy reappeared a few moments after going to make the Scones because he couldn't find a Stork Tub in the fridge (he made a lot of flapjacks in the day and had used it all up) and wanted to know if I had hidden it. I suggested that instead of using the tub of Stork he should using the Baking Liquid as it was the same stuff and so he went off to investigate my claims. Daddy returned about twenty minutes later very excited about the Liquid Stork which took a lot of the mixing effort out of making his scones. We love Stork and normally keep a tub or two in the fridge for baking and I think that the new Stork Easy to Mix Baking Liquid will also become something that we keep in the fridge, especially as Daddy really loves it too. The liquid is £1.59 and available to buy now and there are some recipes at the Bake With Stork website, but over the next few weeks we'll be posting our own. I was sent the Stork Easy to Mix Baking Liquid to try out. There seems to be one common film that all women love or have at least watched once and that is Dirty Dancing. It seemed that as I was growing up, if you didn't have a crush on Patrick Swayze before watching the film then as soon as you watched it you did! Of course everyone knows lines from the film and has had their own personal "I carried a Watermelon" moment and has wished for their own Johnny coming and saying "Nobody puts Baby in the corner"... sorry I just had a moment there. I was offered two tickets to the stage version when it came to Milton Keynes Theatre and so my Mum and I thought we would have a girls night to celebrate our birthdays. When we arrived at the theatre we were unsurprised to see that most of the audience were made up of women, this was definitely a girls night out and the excitement levels were really high. My Mum and I were quite giggly when we saw that one of the cast had sent me a tweet letting us know he hoped we enjoyed the show and we did spend a good ten minutes trying to work out which one he was on stage. Well, it might have been that we were trying to work out who he was or we might have just been ogling the rather attractive male cast members! As it started I was thinking that I wasn't sure how this was going to work, everyone there was a fan of the film and the show was going to have to be pretty spectacular to win them over. Within a few minutes though everyone was totally engrossed in the show, I don't think I have ever heard an audience being so quiet (apart from when joining in, wolf whistling, and generally screaming). The first half of the show seemed longer than the second, but it still moved along at a good pace. There were a couple of scenes that I didn't remember from the film and a couple missing but it didn't really matter the show was still really great. Talking with a friend who had gone to the same performance she thought that the first half of the show was a little slow, but she admitted that the only thing she was looking forward to was the dance at the end where Baby finally does the dance routine perfectly with Johnny! The audience (and me and my Mum) loved the show and we were all swept up with the excitement of the cast. As we walked out at the end my Mum turned to me and said "let's go again tomorrow!" and I was ready to sign us up for Dance lessons too. It was the talk of the playground the next morning (with the husband of my friend who had also gone and then with playground Mums in the afternoon) and my Mum and I couldn't stop talking about it when we called each other in the evening. If you get a chance to go to the show, then do go as it is a great night out and a great excuse to paint the town pink! We were given two tickets thanks to Milton Keynes Theatre. When I was asked if we'd like to do a review of the new menu at Frankie & Bennys in time for mine and Big Boys birthday we said yes. We quite like Frankie & Bennys and the last time we were there (to do a review!) we bumped into one of Top Enders friends who was celebrating a birthday and we thought it would be fun to do the same for BB and I. When we arrived at the restaurant we were greeted by the very friendly Tathra, who showed us to our booth and took our birthday cupcakes from Top Ender. We placed a quick drink order and then we were able to look at the menus for what we wanted to eat. I had to ask what had changed on the menu as I couldn't notice anything different! We had ordered some starters as we forgot that the main meals in Frankie and Bennys are very large compared to what we eat at home. The starters were really nice with both Top Ender and Big Boy tucking into a large Garlic and Mozzarella Bread, Daddy eating his favourite Chicken wings in Sweet Chilli Sauce and I had Garlic and Cheese Mushrooms. We followed this up with a pizza for BB, Chicken and Pasta Bake for Top Ender, Bennys Bacon Steaks for Daddy and New York Chicken for me. All the food arrived quickly and our server (Cristian) made sure to check with us if we needed anything or a refill of our drinks or if he could help and take a picture of us as a family. As he didn't know we were reviewing the restaurant and he gave the same attention to the other tables in his section I am guessing that he wasn't just trying to impress us. 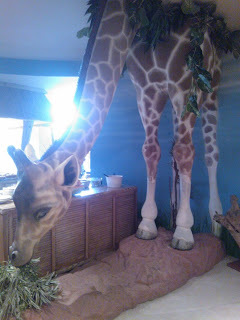 There were of course a few little niggles with the meals, but not enough for us to complain about. I had two onion rings with my meal which were colder than the rest of the meal, Top Enders pasta in my opinion was a little stodgy (possibly overcooked) and Daddy thought that the some of his Bacon Steaks didn't taste quite as he expected (it was supposed to be sweet cured). We didn't finish our meals, but this wasn't a comment on the quality just the size of the portions. We are going to have to remember to not order starters next time! The children decided to have a pudding each and although we looked at the menus and some of the new sundaes Daddy and I decided that there wasn't anything that we were prepared to explode for! Before the puddings arrived Cristian brought out the cupcakes that we had brought in with the addition of some candles. As he did this the music that was playing in the restaurant changed to Happy Birthday and my family and the rest of the restaurant sang Happy Birthday to me. When we came to pay the bill my main meal was free of charge (as I'm a member of the Frankie & Bennys birthday club) but it had come to about £60 (which is about the same price for similar meals in local restaurants to us) before this discount. The problem is for us this is too expensive, we couldn't really afford to eat out here more than once a year (or if we had a voucher like we did) and I might have to start a Family Meal Out Fund Jar so we can make this an annual event. We did all have a really great night out and we were all really full at the end of it, so on balance I think it is a great family restaurant. We were supplied with a voucher to pay for our meal. After the last week of multiple celebrations and over indulgence I was pleased to step onto my scales this morning and to see that I had actually lost 1lb! I was really pleased with this and it means that I have high hopes for this week. Whilst the food might not seem all that healthy and full of salad and low fat options, it is served with plenty of vegetables and I find eating things like Rice, Pasta, and Potatoes fills me up which means no late night snacking which is one of my big vices! I had planned everyday this week with something nice but it was tonight's dinner that I was really stumped with. I was telling my Mum about how as we weren't having a takeaway on Saturdays now I wanted to make something that everyone would like and eat and my Mum suggested Gammon steaks. It was perfect as we haven't had them for a while, the children love them and last night when we had Pizza Daddy added some pineapple and so we had a lot left over that we can use with the Gammon tonight. Daddy thinks he is having beans with the Gammon but because I'm in charge we aren't! We're having a Roast Chicken again for Sunday dinner and I'm going to make some Stuffing to go with it too. I haven't made Gluten Free stuffing from scratch before so it's going to be a new experience and I just hope it tastes as good as I hope it will! As it is the May Bank Holiday we wanted to make something special and that is normally a Roast, but having had it the day before we decided to make a Turkey and Bacon Gougères topped pie with Herby Diced Potatoes. Daddy made Cheese Gourgeres when I was out at Dirty Dancing this week and we thought that they would taste really lovely as a pie topping so we are going to test this theory out! We are having Oyster and Spring Onion Beef with Rice (with Mange Tout) on Tuesday night. The sauce is one that I have in the cupboard already as I tend to keep a couple of packets on hand as it is gluten free and great for a quick last minute stir fry! I would normally serve it with Rice noodles, but I'm not feeling them this week so I will do a quick flavoured Rice. Hopefully it would be as nice as the Special Fried Rice I make with Top Ender. I saw a recipe on BBC Good Food for Sticky Pork which I am going to serve with Mash. You are supposed to use Cranberry sauce, but I have a lot of Redcurrant to use up so I will adapt it to use that. I'm really looking forward to it as this is the meal that has most caught my imagination this week. With Daddy at work on a Thursday night, the children and I like to sit down together to have a meal together and we normally make something that Daddy can't eat. This week I decided to make Macaroni Cheese (and I'll serve it with Hot Dogs) as it is Top Enders favourite. The problem is that Top Ender only likes the ready meal kind and I'd like to have more control over how it is made. Plus I think it is fate as I received a great recipe from Mu Cheese in my email this week so I'm going to have to try it! This Friday Daddy and I are going to be going out and my Mum is going to be looking after the children. I'm not sure what time we are going out yet, but I think it is early so my Mum will be cooking for the children or knowing her will make it a takeaway! I'm planning something simple like Fishfingers, not because my Mum can't cook but because I don't want her spending ages in the kitchen when she could be enjoying her time with her Grandchildren. Top Ender and Big Boy have been long time fans of Polly Pocket. Whilst she isn't as small as I remember her from the sets that my sister used to play with, she still is as much fun and BB and Tops love creating adventures for her to go on. During the half term we were able to go to a morning with Polly Pocket at Chessington World of Adventures at the new hotel, Tops and Big Boy loved it as they were able to play with some Polly Pocket Sets, and make some bracelets and do some colouring too! Whilst Top Ender, Big Boy and Daddy carried on with the drawing and colouring I listened to some information about Polly Pocket. A lot of it I forgot almost immediately but what I did remember is that children, in particular girls, want to be like Polly. They see her as fun and energetic and they want to emulate this. I like Polly as she loves to have fun just like we do and tries to make every day the best day ever. Children can even go and enter a competition on the Polly Pocket Website to win their best day ever or other Polly prizes. Tops joined me for some of the information and this picture was taken of us, isn't it sweet? After we had been to the event in the Hotel (which is fantastic and I can't wait until we can stay) we were given tickets to go into the theme park, I had been before and working it out I must have gone twenty five years ago the first time, which would have made it the year it opened! 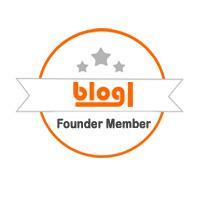 Yes, I realise that this makes me incredibly old but hey, there isn't a lot I don't share here on the blog. We decided which rides we wanted to go on in advance and slowly worked our way through the park. We found all the staff incredibly helpful, especially when we asked a couple of the restaurants about gluten free options. At the Mexican Cantina they were so great they even went and got the packets so we could read first hand the ingredients in everything. Even when one of the rides broke down we were kept well informed of what was going on and were given a complimentary Family Fasttrack to go on any other ride, without queuing, as compensation. We all had the same favourite part of the day and that was when we had been in a Lorikeet enclosure and we were able to feed the Lorikeet and have them sit on our arms. Judging from this Photo though Big Boy wasn't too trusting of the Lorikeets, although it was Top Ender who got the "blessing" down her leg and over her shoes. Thank goodness I carry wet wipes with me where ever I go. We all had a great day in the theme park and walking round the Zoo we found a lot of information points with great visual props to really make sure the information they were giving was understood by children of all ages and I've been using some of the pictures we took as Wordless Wednesday posts (The Average Eight Year Old and Cockatoo Shoes). Big Boy can't wait to go again, and asks us every morning if we can go back. I'm thinking that we will have to save up a bit so we can stay overnight in the hotel, just so I can turn left at the giraffe to get to the toilets again. We were treated to the day by Mattel who gave us a Polly set to take home and Chessington World of Adventures.